We have recently been supplied with a copy of the December 2004, RCVS Position regarding the Early Day Motion — Processed Pet Foods and Vets. Please advise who the intended recipients of the position paper were and where the paper was published. support the use of processed pet foods for everyday feeding of companion animals, together with medicated or ‘science’ diets to provide advanced nutrition for animals that may be unwell, nutritionally deficient or at a certain stage in life’. We note your statement: ‘We have discussed Mr Lonsdale’s concerns with him on a number of occasions.’ Mr Lonsdale tells us he has no recollection of discussions taking place on a ‘number of occasions’. Please advise. more detail, so as to avoid any duplication. I trust this is in order. Could I remind you that in your email dated 8th August, in response to our telephone conversation of the same date, you informed me that you were awaiting the return from holiday of the Registrar, Jane Hern, before replying to my queries. As Ms Hern was expected back on 15th August, I would be grateful for the promised reply. your original letter this week. your queries below are helpful. result, however I would suggest you contact them to check. Manufacturers' Association in its press release dated 17 December 2004. 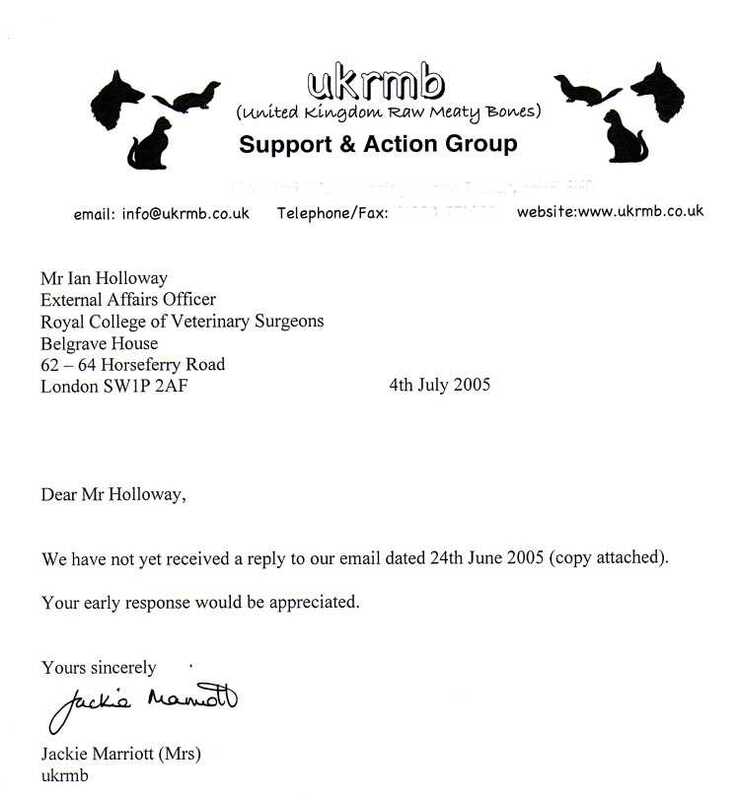 External Affairs Officer, Ian Holloway confirms that the RCVS took no action to inform its 21,000 members of the existence of the 7 December 2004, Early Day Motion that called into question the basis of veterinary life in the UK. Instead, in consultation with the Pet Food Manufacturers Association, they prepared a statement trivializing the concerns of Members of Parliament. The RCVS adopted a strategy calculated to suppress discussion and to strengthen the protective cordon around the pet-food industry/veterinary profession alliance. The 17 December 2004 self-serving statement from the Pet Food Manufacturers Association concludes with the incriminatory statement: ‘The majority of veterinary surgeons, and veterinary associations would recommend feeding a commercially prepared, balanced diet.’ The RCVS, although responsible for policing the veterinary profession, rather than investigate what amounts to a massive scientific and consumer fraud, identifies itself with and endorses the fraud. Mr Holloway’s final paragraph seeks to explain misrepresentations by the RCVS but in fact further confirms their egregious behaviour. a.) Documented correspondence exists to confirm that it was Dr Lonsdale, not the RCVS, who requested the one and only discussion that took place between himself and a veterinary representative of the RCVS. b.) Other email communications now labelled ‘discussions’ took place between Dr Lonsdale and The Registrar of the RCVS. The Registrar is a lawyer, not a veterinary surgeon. She variously sought to prevent Dr Lonsdale from making statements in his manifestos, sought to dismiss the importance of the manifesto statements and sought to trivialise the approximately 9% voter support received annually over a nine year period. c.) The refusal of the UK veterinary press to review Raw Meaty Bones effectively prevented British veterinary surgeons from knowing about and discussing the peer-reviewed and other evidence. The Registrar dismissed concerns about the barriers the British veterinary journals erected. Far from conducting discussions, the Registrar of the RCVS reinforced barriers to discussion. We have discussed Mr Lonsdale’s concerns with him on a number of occasions and have urged him to submit scientific evidence to support his claims and to publish this material in peer-reviewed (veterinary) scientific journals. We understand that Mr Lonsdale has not yet accomplished this but we would encourage him to do so. Dr Lonsdale’s 2001 book Raw Meaty Bones is a 389 page compilation of the peer-reviewed and other evidence from the global veterinary, medical and dental literature. In the book Dr Lonsdale provides a detailed account of two of his own papers published in peer-reviewed journals. Importantly, Dr Lonsdale presents compelling evidence that the veterinary journals run a closed shop where the so called peer-reviewed evidence is mostly misleading or corrupt. Raw Meaty Bones has been reviewed in open peer review by five veterinary surgeons, including the current and two former Directors of the Sydney University Post Graduate Foundation in Veterinary Science. widespread scientific and consumer fraud. * The Department of Environment Food and Rural Affairs relies on advice from the RCVS. interests of pets, pet owners and the wider British community.